Once again disappeared for a whole week…. no blogging and friends were wondering if I had run out of recipes. Hardly the case. It’s just that I went to meet my son in Dubai and spent a whole week getting dazzled by the tall buildings, all the gold and diamonds and the endless number of restaurants. I got to taste bao (chinese steamed bun), nice soft and less salty halloumi cheese and goat cheese. I would have tried out a lot more variety of food but the serving portions are huge. Its amazing how you can find practically any sort of cuisine in Dubai. Dubai as a holiday destination is fine but I think to stay in connected with the rest of the world we need to live in the real world. So when I landed in Mombasa, I was actually glad to see litter, shacks and pot holed roads. Now that’s the real world. Yesterday, Kenya had its first election under the new constitution. Ajay and I were up really early and at the polling station by 6a.m. Though we had to wait in the queue for forever, felt really great voting. We are still waiting for the results.I think everyone is ready for a new beginning and we all pray for peace. Since this week I have that patriotic feeling running through me, I decided to share with you a very coastal dish which is mamri. Mamri is basically like a doughnut but it is flavoured with coconut and perhaps has an indian influence of adding cardamom. Doughnuts are rings, but mamri is usually triangular in shape. They differ from the mandazi slightly. I love mamri with corn in coconut curry or with mbaazi (pigeon pea cooked with coconut milk). Mamri is eaten even for breakfast with tea or coffee or as a snack. Sieve flour into a big bowl and mix in the cardamom powder and sugar. Add the instant yeast and mix well. Add 1 tbsp ghee and rub it into the flour. Mix the hot milk and coconut milk. Using the milk mixture, form a soft dough. Using the remaining butter or ghee, knead the dough for 5 minutes till it becomes smooth. Lightly grease a bowl. Place the dough in it. Cover with cling film and let the dough rise for about 1½ – 2 hours. Sieve some flour onto baking sheets or trays sparingly. Knead the dough gently. Divide the dough into 8 parts. Roll out one ball into a 6 inch diameter circle. Cut it into 4 parts using a sharp knife or a pizza cutter. Place the triangles onto the floured baking sheet or tray. Repeat step 10 to 12 with the remaining dough. Place the trays or sheets in a warm place covered. Let the triangles rise for about 45 minutes. Heat oil in a frying pan, wok or karai oer medium heat. When it is hot, place the triangles (3 to 4 at a time) in it gently and fry till they are golden brown. Remove the fried mamri into a colander and repeat with the remaining triangles. Serve hot with any curry of your choice or some spicy tea. Mamri can be served with chicken or fish cooked in coconut milk. To make fresh thick coconut milk, grate a coconut. Add a bit of water to the grated coconut and blend it in a liquidizer. Put the coconut and water into a sieve and squeeze out the milk.This is the thick milk. Put the coconut back into the liquidizer with some more water. Blend and squeeze out the milk again. This time you get the thin milk which can be used for cooking fish, chicken, pigeon peas or corn or even used for making coconut rice. Store leftover mamri in an airtight container so that it does not dry up. Can roll the dough into small circles and make mamri. Similar size to a puri. If you are not using instant yeast, then use warm milk to activate the yeast. Let the yeast become frothy for 10 minutes before using to form the dough. Cover the rolled mamri with a thin cotton cloth if you are leaving it out to prove. The dough should not be too soft as it will be difficult to pick the mamri up for frying. This is something totally new to me! I love that the dough has coconut! This sounds so tasty, Mayuri! 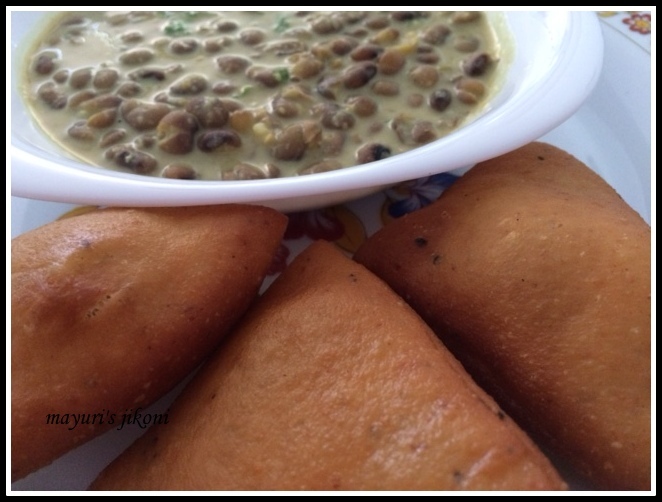 My wife and bhabhi made this dish for all of us when we visited Mombasa, it was really tasty….